Eye have no idea what this is. Picture this: You are strolling along your favorite beach, taking in the serene morning sun with Scruffy, your new and rambunctious corgi puppy. It's Florida, so the autumnal weather hasn't quite put a damper on your early morning ritual. Both you and Scruffy are feeling frisky, so you let him of his leash to run in the waves and poke around in the seaweed. You laugh as Scruffy dashes into the cool green waves, yipping in delight, before sniffing at something in the sand. "What's that you got there, boy?" you might ask before - "Poseidon's Trident, WHAT IS THAT THING?" At least, I imagine that's what happened when someone discovered a huge disembodied eyeball in Pompano Beach, 30 miles north of Miami, yesterday morning. 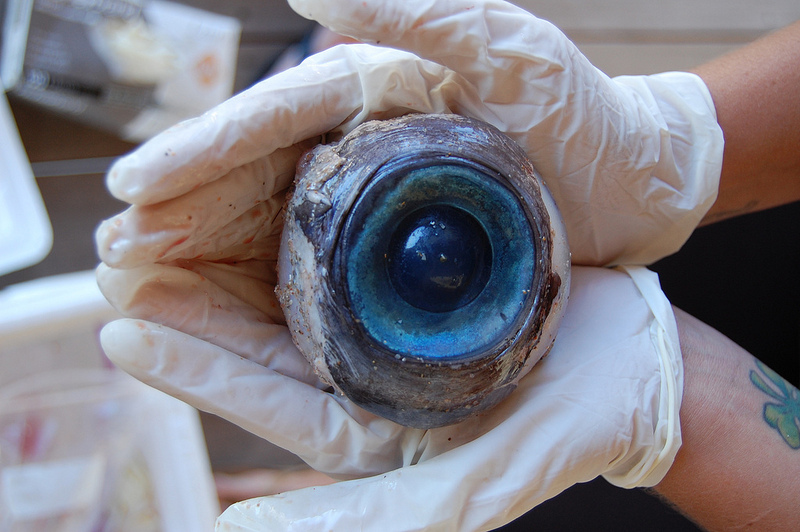 The Florida Fish and Wildlife Conservation Commission had officials quickly go to pick up the specimen and posted pictures of the eyeball on its Facebook page, but even they are not certain exactly what kind of eye it is. The intrepid marine biologists dressed in red skull caps like Steve Zissou - again, this is what I pictured - placed the monstrous eye on ice and promised to perform DNA tests to identify what species it might be from. 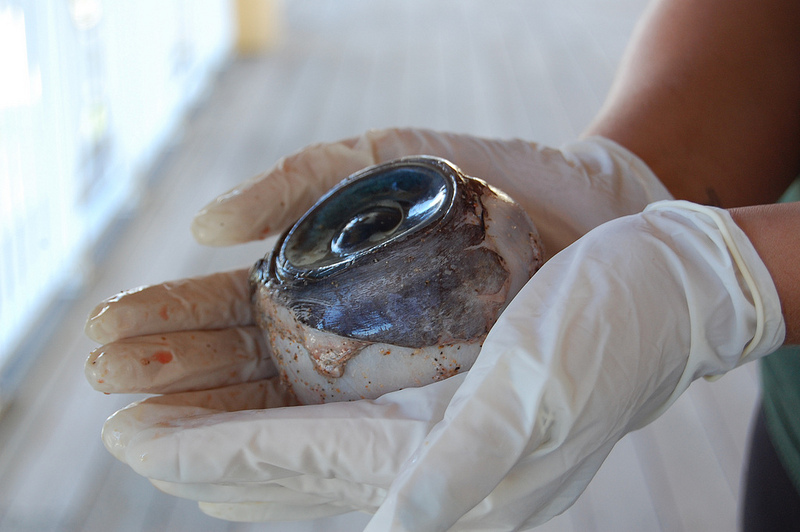 Other marine biologists chimed in as to what creature could have such a large optic organ. 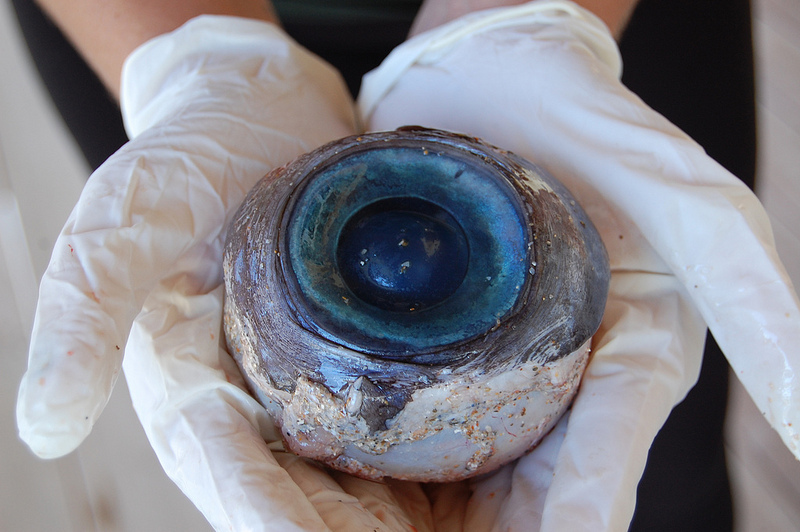 "It probably is a squid eye - other things with eyes that big (fish, cetaceans) have them embedded in hard tissue. Squid eyes are in relatively soft tissue and more likely to dislodge as in the photo you sent. A quick DNA analysis could easily sort it our for you," said Robert L. Pitman, a marine biologist with the National Marine Fisheries Service in La Jolla, California. Not so fast, Pitman. Apparently, there is more to this eye than meets the eye. "There appears to be bones around the eye, so that would rule out a squid. The primary suspect right now is that it would be a large fish," said Carli Segelson from the Florida commission and she was confident the experts would identify the species soon. "I shouldn't say this, but they may be able to eyeball it." Har de har har, Carli. This is no laughing matter. I'm the only person authorized to make bad fisheye puns here.